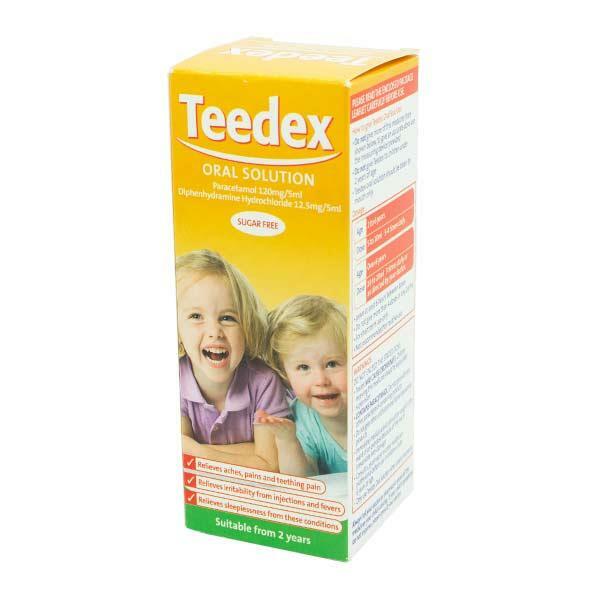 Teedex is a painkiller for children aged between 2 and 12 years. This raspberry flavoured oral solution contains both paracetamol and diphenhydramine hydrochloride. This medicine is also free from sugar and includes a dosing syringe. Cannot be purchased with Dozol. Do not take with any other paracetamol products. Each 5ml of Dozol contains the active ingredient paracetamol 120mg and diphenhydramine hydrochloride 12.5mg. The other ingredients include:propylene glycol, liquid sorbitol (E420), liquid maltitol (E965), ethyl, propyl and methyl parahydroxybenzoates (E214, E216, E218), amaranth red (E123) and raspberry flavour (contains ethanol). Teedex contains Paracetamol, which is a painkiller suitable for children between the ages of 2 and 12 years. This medication helps in relieving pain from such ailments as toothache, sore throats, earaches colds and flu and general aches and pains. This medicine also reduces high temperatures and fevers associated with infections such as chicken pox, whooping cough, measles and mumps. It also contains diphenhydramine hydrochloride which helps with sleeplessness associated with the above illnesses.